Two more Austin residents were injured Sunday evening in an apparent bombing, local police confirmed Monday. This marks the latest in a series of explosions that has kept Texas' capital city on edge. 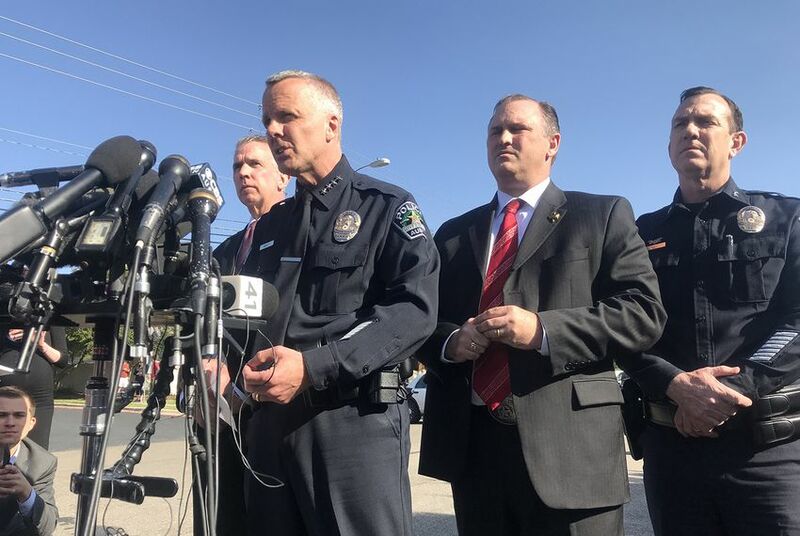 For the fourth time this month, a bomb exploded in an Austin residential neighborhood Sunday night, seriously injuring two people and alarming law enforcement that a sophisticated “serial bomber” might be at work in Austin’s capital city. The most recent explosion appears to have been triggered by a tripwire mechanism, police said, signifying a level of sophistication and perhaps randomness that hadn’t been seen in the previous bombings. Still, authorities said there are similarities in the case that lead investigators to believe that the bombings are related. "We are clearly dealing with what we expect to be a serial bomber," said Brian Manley, Austin's interim police chief. The most recent bombing happened in an upper-middle-class neighborhood in southwest Austin. Manley said that a 22-year-old man and a 23-year-old man were walking along a sidewalk when they inadvertently triggered the bomb, which was sitting near a fence. Both men were seriously injured and remained hospitalized late Monday morning. Police said their conditions were stable. That raises the total number of victims in the bombings to six — two who were killed and four others who were seriously injured. But several things were different in the most recent attack. For one, police said the bombing appeared less targeted. In the previous three cases, the bombs appeared to be packages left at specific houses. In addition, the victims of the most recent attacks were white. The prior victims were people of color, which had set off fears that the bombings might be racially motivated. This was also the first bombing outside of East Austin, an area of the city that has historically been home to black and Hispanic residents. With the change in methods and the new location of the most recent bombing, authorities said they were at a loss over the motive of the attacks. Hours before the fourth bombing, Manley made a public request for the perpetrator to reach out to police and explain the “message” of the attacks. He made a similar plea Monday. Manley also urged residents to be even more cautious than they have been before. Anyone could have been hurt in the most recent bombing, even children, he said. "The belief that we are dealing with someone who is using trip wires shows a higher level of sophistication, a higher level of skill," Manley said. The two people killed in prior bombings — 39-year-old Anthony Stephan House and 17-year-old Draylen Mason — died on March 2 and March 12, respectively. Mason's mother was also injured. Hours after the explosion that killed Mason, 75-year-old Esperanza Herrera also received an exploding package bomb. She was seriously injured but is expected to survive. Hundreds of law enforcement officers have responded to the attacks. In addition to Austin police, more than 350 FBI agents are working the case along with Texas Department of Public Safety troopers and bomb technicians from Houston and San Antonio. On Sunday, Manley announced a reward of $100,000 for information leading to the arrest of the person or people responsible. Gov. Greg Abbott previously said that the Office of the Governor’s Criminal Justice Division is offering an additional $15,000. Abbott also announced Monday that he was releasing $265,500 in emergency funding for Austin police to buy seven bomb-detecting x-ray systems. “I want to ensure everyone in the Austin region and the entire state that Texas is committed to providing every resource necessary to make sure these crimes are solved as quickly as possible,” Abbott said. Talk to us: With a fourth bombing reported in Austin over the weekend, we're interested in learning how residents are using technology to follow this story. Have you used apps like Nextdoor, Nest or Ring to track or report suspicious activities or communicate with neighbors? We'd like to talk to you. Email Alex Samuels at asamuels@texastribune.org.